Eventually I found an old article with the 2013 results and compared them to our time. Subculture Racing’s 2013 record: 11:26.987. Team Johnny Killmore’s 2016 time: 11:26.644: a difference of only 0.343 seconds. If I had missed one more upshift, if I had slacked off in one turn, or if Matt had missed one transition… no consolation, no do-over. We didn’t come to win the race, we came to set the record. We came so close to missing our mark.. but we did not miss. You spend the whole morning trying to get here, and when you finally see it you feel sad because you know it’s over. 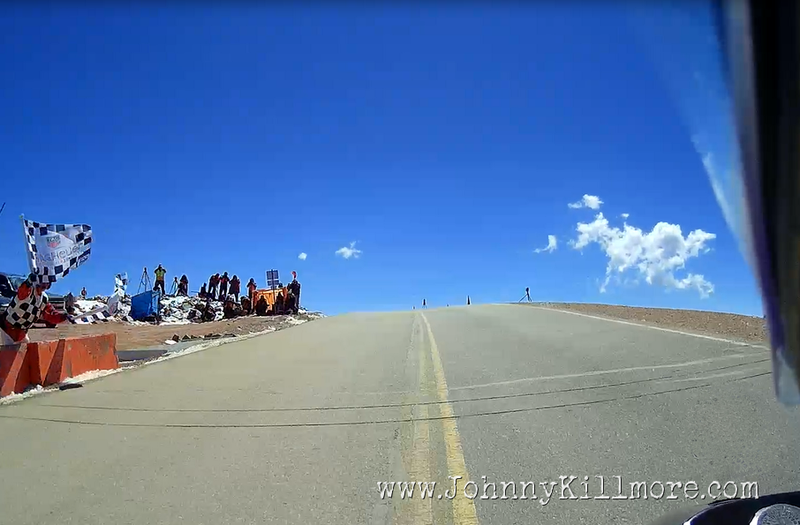 It really was the perfect Pikes Peak Hill Climb for us. Several unknowns, confusion, the unexpected, then hanging out at the summit eating donuts and getting sunburn, windburn, snow, rain, and hail within a few hours. On the upside, the race official’s decision to limit the field to 100 entries meant the program was run before the setting sun and afternoon lightning came in. There were some crashes and some injuries, but everyone survived. Taking advantage of the drying track, Bruno Langlois won the motorcycle division with a 10:13, beating Don Canet on the Empulse TT electric bike by a little over four seconds. This is interesting to note since Don had to run on a much wetter track as the first bike of the day. Two seconds further adrift was Jeremy Toye on the Project 156 Victory. Lighting beat thunder this year, but it’s never that simple. This isn’t about internal combustion vs electric power. This is about a fully developed race bike with years of R&D going up against a still-developing engine bolted into a chassis built by a guy with Biker Build-Off trophies on the wall, not engineering degrees. The machine is gorgeous but in motion I am guessing it handles just like it looks: beastly. Check out the full results here. We even had a great snowball fight on the ride down with Les Marluches, the French rally team who uses a road-based Benelli outfit back home to run many different kinds of events on dirt and tarmac (that’s asphalt to us Americans). We also found Wade & Christine of Subculture Racing and it was only a mechanical issue the stopped them from making the summit. A bummer indeed, but much better than spinning into the trees. Team Les Marluches rebuilt their engine with vintage car parts that not only fit, but ran well the remainder of the week. Photo credit Les Marluches. 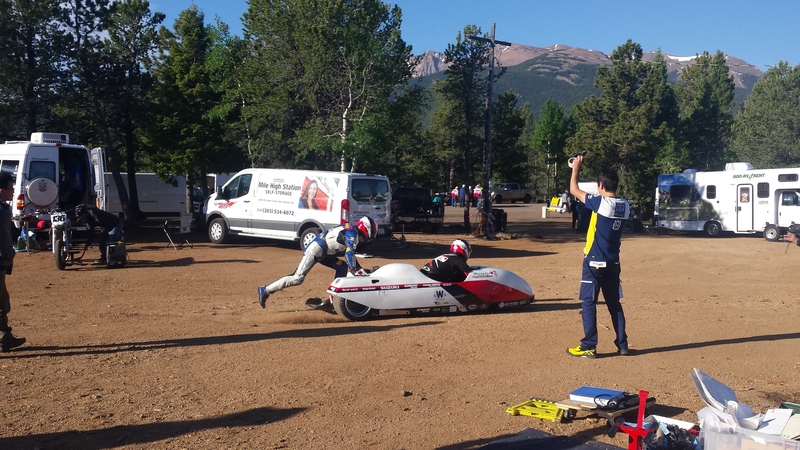 Pikes Peak is unlike any other event I run. I wish America had more of a love affair with real-roads racing but stage rally in cars is about all we have, and they do not have tarmac stages in the US, let alone a sidecar class. It’s a shame there aren’t more choices, especially considering the cost. 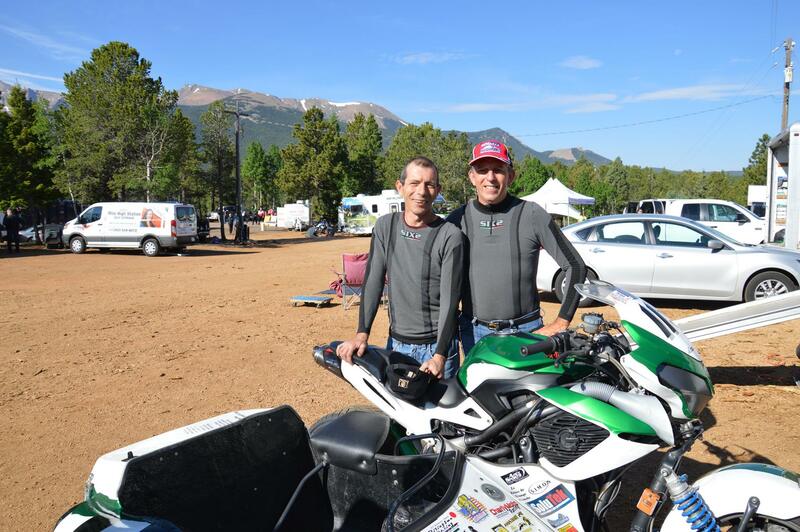 The sidecar entry fee for Pikes Peak is $1500, or about seven times the price I usually pay from the small-time regional events that are open to sidecars. However, the tough part is that sidecars are lumped into a class called “Pikes Peak Challenge” with other classes such as the electric bikes and “Exhibition Powersport,” a catch-all for any machine that does not fit in a class, such as Victory’s Project 156. This puts any shot at prize money in a very hard to reach place. We would need to beat every sidecar along with all of the electric bikes, then beat any random Joe that gets accepted with a non-compliant bike, all while running three wheels and carrying two people. To the credit of the organizers it was made clear in the rulebook as well as a bulletin, but that doesn’t do much when I return to my sponsors with nothing more than a smile and a handshake. I don’t personally race for trophies, but I learned their wider importance after serving as President of the SRA-West for several years. You set that big chunk of glass on your sponsor’s shop counter and give them something to talk about with customers. You let other people feel proud of what you did. It’s not about your ego; it’s about other people getting excited about life. Not your life… life in general. And if Team Rising Sun had won, after spending all week just trying to get their engine started, I would have felt gutted to watch them head back to Japan with nothing. There was not a single mention of sidecars during the award ceremony and the feeling that day was one of exclusion. We brought four teams from three countries, and at least one rookie team from a fourth country did not receive an invitation due to the limited field size this year. Why are sidecars such outcasts? Despite that sour taste, I have good feelings when I stumble across the Pikes Peak Hill Climb logo or find the errant email in my inbox from them. It’s a great event that happens to be less attractive to sidecars with each passing year. Perhaps it’s time for me to reopen talks with Gina about racing a Bug in some desert and stage rally events? Or maybe I’ll hang the racing gear up and find adventure somewhere else entirely… it’s a big world. In any event, it’s a helluva cool race, among very few left. The pavement made a lot of people upset that something was lost in the mystique, but to me it stands out even more now. The few hill climbs and rallies left in America aren’t done on asphalt, and the vehicles involved have gotten that much more wild as a result. Thanks to all you lunatics out there for following along and especially to all the people who donated, including G-Form & Evolv. Fran Hall at Superlite Cars put together a bike that I’m still exploring the limits of. It ran so trouble-free that I was nervous all race-week: I’m not used to having that much down time. Moto Guild in San Francisco gave me free reign of their shop to get ready and Deb McDaniel way out in Georgia gave me a lot of support as she has for years now. Thanks so much for believing in me. I am left now to contemplate the rest of the racing season and just where the hell this story arc is supposed to be going. If you’ve read this far, you must and I must be kindred spirits. So dear reader, I leave you with a wave and my fight song. You never know until you try. Water, pavement patches, animals, snow… you never know what you are going to get. Green means go. Revs up, clutch out. No more waiting. Engine no workie for the Project 156 bike. The problem did not appear serious. Still life with marmot. This is is more dangerous than any photo or video can make it out to be. Just ask the marmots.